What do you do when you have enough photos to fill a landfill? Besides putting the photos in albums for the kids and making them take them or else; besides taking out a bank loan to have them all digitized, what do you do with a gazillion photos that you just can't let go? It's become almost overwhelming. Half of my pictures are thrown in albums and half are thrown into boxes which have gotten all mixed up during our many moves. I can't seem to be able to toss them. Sometimes if there is a divorce, kids don't want the "before divorce" pictures, but might some day. What to do, what to do. Help! I had a friend who made wallpaper out of theirs. It looked pretty cool and it was pretty fun to see guests reactions. Store them somewhere.We have good services on the web offering storage services.Sell them in online marketplace. Selling them might be a good idea. I'm so old, I have pictures from the 40s! I do buy pictures myself from istockphoto, but never checked on their requirement to sell them. Thanks so much! 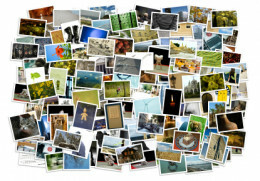 Create a photo collage. .
Do you feel the art of collecting actual photographs in photo albums has become a thing of the past? Will creating photo albums mess up already embedded pictures? Will the new 1500 word Golden Standard Change the Way You Write?